Very recently, a Category 4 Hurricane, Harvey 2017, came ashore on 25 August near Corpus Christi, Texas in the United States. The weather fronts were such that the hurricane moved inland only approximately 50 miles, stalled there, then moved southward back over the Gulf of Mexico on 28 August. The weather front north of the hurricane weakened, such that the hurricane or tropical storm system then moved parallel to the Texas coast in a north-easterly direction before crossing the shore near the Texas-Louisiana border and moving northward up the Mississippi River valley. The slow movement over land and over water for the second time resulted in heavy rains over much of southeast Texas and parts of Louisiana. In many Texas locations, records for rainfall in one storm event were broken. Just over 50 inches of rain fell in at least one location. Rivers swelled, overflowed, and many set new records for high levels. Property was flooded in thousands of locations. 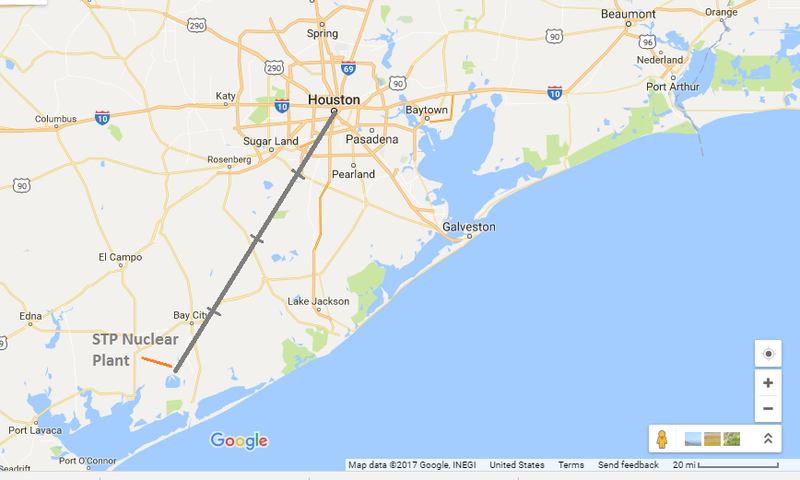 A set of two artificial dams just to the west of Houston, Texas (Barker and Addicks dams) were filled to the danger point. The water operating authorities chose to release water from the reservoirs behind the dams to prevent catastrophic dam failures. That water release flooded thousands more homes. Many roads were underwater in Houston and surrounding areas, including major freeways. No evacuation order was issued for the large, populous city of Houston, Texas. Instead, the mayor advised the residents to shelter in place. There were, however, a number of mandatory and voluntary evacuations ordered in other smaller cities and towns. The mayor stated publicly that it was impossible to safely evacuate 3-4 million people in such short time, citing the recent failed evacuation attempt for Hurricane Rita. There were also many deaths on the highways in that failed evacuation attempt. Meanwhile, with all the flooding over such a widespread area, the 2,700 MW twin-reactor nuclear power plant located only 70 miles southeast of Houston's downtown area, kept running at full power. (see figure 1) The South Texas Project Nuclear Operating Company chose to keep running, at least in part to further their reputation as the nuclear plant with the highest on-stream factor in the US. The question explored here is, was it wise to keep the STP (South Texas Project) operating at all during the flooding period of several days, when it would be impossible to evacuate the population located downwind of the plant if a massive radiation release event occurred. The fundamental issue is that nuclear plants certainly can meltdown, as at least five have done so in the past. (Three Mile Island, Chernobyl, and three each at Fukushima-Dai-ichi). All nuclear plants must have an evacuation plan, per government requirements. That evacuation plan is predicated on the affected population having the means to evacuate. 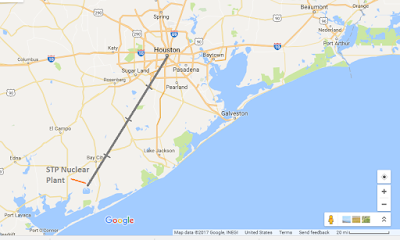 Clearly, the huge area in south and east Texas had no means to evacuate after the flooding began. It appears that the STP made it through the flooding and high winds, but were they simply lucky this time? A look at the events that cause nuclear plants to shut down suddenly, without warning, shows that even the smallest problem can result in a shutdown. A pump can breakdown, a valve can stick, a steam generator tube can rupture, just to list a few. It is also necessary to consider whether the electricity grid was or would be stressed if the STP shut down. The Texas grid operator is ERCOT, for Electric Reliability Council of Texas. It certainly appears that ERCOT did not need the power from the nuclear plant, with so much of the service area without power due to the winds and flooding. Instead, it appears the nuclear plant owners and operators placed their reputation for onstream days, for high onstream factor, above the safety of the public in the fourth largest metropolis in the country. Knowing the city could not evacuate even if they tried, they kept running the reactors, pumping electricity into the grid when nearly one-fourth or more of the state's electric customers could not take power even though they wanted to. Surely the entire liability scheme must be re-examined in light of these events. For anyone other than a nuclear plant that is protected by the Price-Anderson Act provisions, operating with reckless disregard for human life, or operating in a normal manner that is reckless in the circumstances, can be a criminal act. The nuclear power plants must be shut down, and as soon as possible. Millions of lives are at stake, or damaged forever for those that survive a nuclear meltdown with high winds that blow the radioactive particles into their homes, their businesses, and their very lungs.